How many Olympians have come out of Bribie Steve? In March 1945 he embarked in an old lifeboat, landed by chance on nearby Bribie Island, and found 'the idea of the bush that haunted me in India and brought me back here against all reason'. He stayed seven months, but, after the theft of his diaries, moved to Melbourne and to Lina Bryans's Darebin studio at Heidelberg. There he lived among other artists and worked tirelessly for two years, seemingly content. Most of the gouaches he produced were irretrievably damaged before reaching the Redfern Gallery. At the end of 1947 Fairweather went back to Cairns and later sent his work to the Macquarie Galleries, Sydney. In September 1949 the gallery organized a solo exhibition, and subsequently showed his work almost annually until 1970. In 1949 he moved off again, through Bribie and Townsville to Darwin, where he lived in an old boat during 1951-52. His relatively scarce drawings mostly date from this Cairns-Darwin period. On 29 April 1952, having carefully studied seamanship and navigation, he set out for Timor in a small raft which he had made from discarded materials. After almost perishing, he collapsed on the beach at Roti, Indonesia, sixteen days later. He was interned, shunted to Timor, Bali and Singapore, then (apparently after diplomatic intervention) placed in a home for derelicts whence he was repatriated to England. It was some five years before direct references to the raft experience appeared in his painting (including 'Lit Bateau' and 'Roti'). In England, Fairweather dug ditches to help repay his passage, but his 'strange experience going home after twenty-five years . . . wasn't a happy one'. Eventually his relations funded his return to Australia. Reaching Sydney in August 1953, he headed straight to Bribie, 'glad to be back in the sun . . . in the friendly bush'. On a site affording him almost complete solitude, he erected two Malay-style thatched huts of local bush materials in which to live and work. 'Roi Soleil' (1956-57) began his larger works. From mid-1958 Fairweather used synthetic polymer paint, often mixed with gouache; thereafter his works were generally more stable. Thirty-six abstract paintings sent to the Macquarie Galleries in 1959-60 are among Australia's finest. 'Last Supper' (1958) was the first of his great religious subjects; 'Monastery' (1961) won the John McCaughey Prize in 1966; and his largest, 'Epiphany' (1962), Fairweather thought his best. His exhibition at the Macquarie Galleries in August 1962 remains significant in Australian art history. From early 1963 Fairweather devoted more time to translating and less to painting: he translated and illustrated The Drunken Buddha (1965). His painting, 'Turtle and Temple Gong', won the W. D. & H. O. Wills prize in 1965. A travelling retrospective exhibition of eighty-eight of his works, mounted by the Queensland Art Gallery that year, enabled Fairweather to see, for the first time, his paintings publicly shown. His work had also been included in the Bienal de Sao Paulo, Brazil (1963), and toured Europe with 'Australian Painting Today' (1964-65) and Asia with 'Contemporary Australian Paintings' (1967-68). 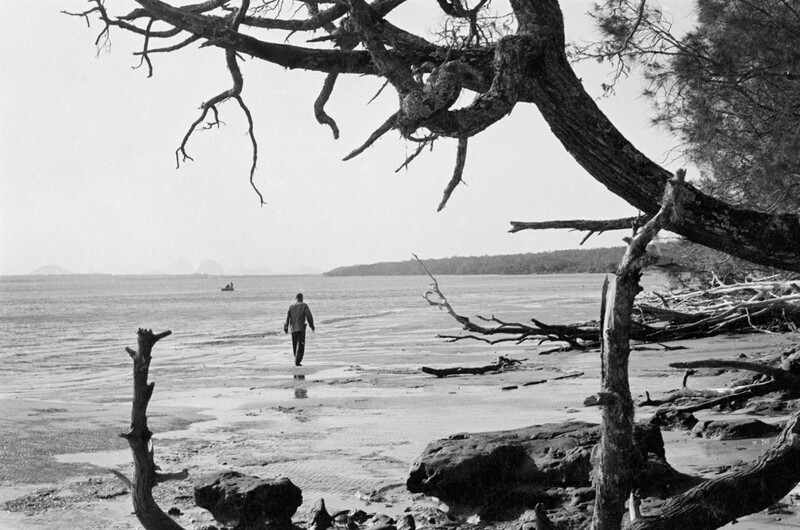 Bribie's increasing accessibility and tourist appeal—acknowledged in 'Barbecue' (1963)—together with the publicity that surrounded his exhibitions, prompted Fairweather to leave Australia on 7 August 1965. He went to Singapore and India, then returned in September. One year later he flew to London, where he contemplated establishing a studio. Realizing that he was a misfit, he came back to Bribie. He briefly resumed abstract painting in 1968, producing his last great work, 'House by the Sea'. In 1973 his fellow artists bestowed on Fairweather the International Co-operation Art Award for his outstanding contribution to art in Australia. About 1970 publicity had prompted investigations which revealed that he owed a five-figure sum to the taxation office. Fairweather's inability or unwillingness to accept his increasing income had prompted the Macquarie Galleries to establish a trust account on his behalf. The realization of his financial security came too late for his enjoyment. Plagued by arthritis and cardiac disease, from 1969 he had found it hard to stand and paint (in his customary manner) over a low, flat table. He died on 20 May 1974 in Royal Brisbane Hospital and was cremated with Presbyterian forms. Fairweather's work is held by the National Gallery of Australia, Canberra, all State and many regional galleries, the Tate gallery, London, the Leicester art gallery and the Ulster museum, Belfast. Many influences affected him, including Turner, Cézanne, Chinese culture and Buddhism. Chinese calligraphy, Post-Impressionism, cubism, abstraction and Aboriginal art strengthened and individualized his style. The content of his work was significantly autobiographical, and mostly reflective. A master colourist, he used colour sparingly. Starting as a landscape painter, he became more interested in figures, almost exclusively in people 'generally speaking'. 'MO, PB and the Ti Tree' is a rare portrait of individuals. He worked slowly, making many alterations as ideas occurred to him, whether by day or at night. 'Painting to me is something of a tightrope act; it is between representation and the other thing—whatever that is. It is difficult to keep one's balance'. A tall, slim figure, with intense blue eyes, Fairweather had a shy, gentle and dignified manner. He resented interference with his style of life, which was reclusive, self-disciplined, austere, and determinedly unrestrained by society. His painting, an 'inner compulsion', was self-consuming—'It leaves no room for anything else'. Nice photo. Always seems weird in Qld to see someone on the beach in long pants and shoes, NOT that there is anything wrong with that. I was just thinking about airplanes blowing up. We're you flying reconnaissance low over the Board Riders Pointscore ctd and collided with the club historian's drone? Al, am I dreaming this or have you previously been in a plane crash? My Favorite Ian Fairweathers story.....apart from his raft...is when someone sent him two pairs of pyjamas since that was all he wore. He sent one pair back since he could only wear one pair at a time. One of the first artists I became aware of and just thought that was how artists lived. Orange of all places has a good collection of his work. It's funny, last time we were on the island, I took my wife to that exact location. She has a photo of me fishing the flats there with that exact same driftwood on the beach. And he calls himself a writer. when the revolution comes, pedantic baby boomers will be first against the wall. Now, now Steven, just because you blew up a bus theres no reason to go prancing around acting like a terrorist. By definition, driftwood needs to drift, if you get my drift. Steve's had a bad year with vehicles. Driftwood is a noun, not a verb. Gotta be honest, Bribie sounds like a hot stinking hell. And it doesn't even drift. What a ripoff.